Nelson, M. (2017). The Role of a Mentor Teacher’s TPACK in Preservice Teachers’ Intentions to Integrate Technology. Journal of Technology and Teacher Education, 25 (4), 449-473. Waynesville, NC USA: Society for Information Technology & Teacher Education. Retrieved April 20, 2019 from https://www.learntechlib.org/primary/p/178211/. Angeli, C., & Valanides, N. (2009). Epistemological and methodological issues for the conceptualization, development, and assessment of ICT–TPCK: Advances in technological pedagogical content knowledge (TPCK). Computers& Education, 52(1), 154–168. Chau, P.Y.K. (1996). An empirical investigation on factors affecting the acceptance of CASE by systems developers (English). Information& Management, 30(6), 269–280. Cheung, A.C., & Slavin, R.E. (2013). The effectiveness of educational technology applications for enhancing mathematics achievement in K-12 classrooms: A meta-analysis. Educational Research Review, 9, 88–113. Dong, Y., Chai, C.S., Sang, G.-Y., Koh, J.H.L., & Tsai, C.-C. (2015). Exploring the profiles and interplays of pre-service and in-service teachers’ technological pedagogical content knowledge (TPACK) in China. Educational Technology& Society, 18(1), 158–169. Ertmer, P.A., & Ottenbreit-Leftwich, A.T. (2010). Teacher technology change: How knowledge, confidence, beliefs, and culture intersect. Journal of Research on Technology in Education, 42(3), 255–284. Ertmer, P.A., Ottenbreit-Leftwich, A.T., Sadik, O., Sendurur, E., & Sendurur, P. (2012). Teacher beliefs and technology integration practices: A critical relationship. Computers& Education, 59(2), 423–435. Fishbein, M., & Ajzen, I. (1977). Belief, attitude, intention, and behavior: An introduction to theory and research. Reading, MA: Addison-Wesley. Greene, B.A. (2015). Measuring cognitive engagement with self-report scales: Reflections from over 20 years of research. Educational Psychologist, 50(1), 14–30. Harel, O., Zimmerman, R., & Dekhtyar, O. (2008). Approaches to the handling of missing data in communication research. In A.F. Hayes, M.D. Slater, & L.B. Snyder (Eds. ), The Sage sourcebook of advanced data analysis methods for communication research. Los Angeles: Sage Publications. Retrieved from http://public.eblib.com/choice/publicfullrecord.aspx?p=3032415 Harris, J., Mishra, P., & Koehler, M. (2009). Teachers’ technological pedagogical content knowledge and learning activity types: Curriculum-based technology integration reframed. Journal of Research on Technology in Education, 41(4), 393–416. Hayes, A.F. (2013). Introduction to mediation, moderation, and conditional process analysis: A regression-based approach. Guilford Press. Hu, P.J.-H., Clark, T.H., & Ma, W.W. (2003). Examining technology acceptance by school teachers: A longitudinal study. Information& Management, 41(2), 227–241. Hutchison, A., & Reinking, D. (2011). Teachers’ perceptions of integrating information and communication technologies into literacy instruction: A national survey in the United States. Reading Research Quarterly, 46(4), 312–333. Igbaria, M., Zinatelli, N., Cragg, P., & Cavaye, A.L. (1997). Personal computing acceptance factors in small firms: A structural equation model. MIS Quarterly, 279–305. Koh, J.H., & Divaharan, H. (2011). Developing pre-service teachers’ technology integration expertise through the TPACK-developing instructional model. Journal of Educational Computing Research, 44(1), 35–58. Legris, P., Ingham, J., & Collerette, P. (2003). Why do people use information technology? A critical review of the technology acceptance model. Information& Management, 40(3), 191–204. Ma, W.W., Andersson, R., & Streith, K.-O. (2005). Examining user acceptance of computer technology: An empirical study of student teachers. Journal of Computer Assisted Learning, 21(6), 387–395. Mishra, P., & Koehler, M.J. (2006). Technological Pedagogical Content Knowledge: A Framework for Teacher Knowledge. Teachers College Record, 108(6), 1017–1054. Https://doi.org/10.1111/J.1467-9620.2006.00684.xMouza,C. (2016).Developingand assessing TPACK among pre-service teachers. Handbook of Technological Pedagogical Content Knowledge (TPACK) for Educators, 169. Pamuk, S., Ergun, M., Cakir, R., Yilmaz, H.B., & Ayas, C. (2015). Exploring relationships among TPACK components and development of the TPACK instrument. Education and Information Technologies, 20(2), 241–263. Schepers, J., & Wetzels, M. (2007). A meta-analysis of the technology acceptance model: Investigating subjective norm and moderation effects. Information& Management, 44(1), 90–103. Schmidt, D.A., Baran, E., Thompson, A.D., Mishra, P., Koehler, M.J., & Shin, T.S. (2009). Technological pedagogical content knowledge (TPACK) the development and validation of an assessment instrument for preservice teachers. Journal of Research on Technology in Education, 42(2), 123–149. Tamim, R.M., Bernard, R.M., Borokhovski, E., Abrami, P.C., & Schmid, R.F. (2011). What forty years of research says about the impact of technology on learning a second-order meta-analysis and validation study. Review of Educational Research, 81(1), 4–28. Teo, T. (2009). Modelling technology acceptance in education: A study of preservice teachers. Computers& Education, 52(2), 302–312. Teo, T. (2010). 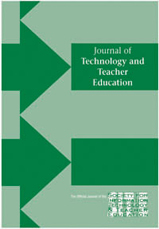 A path analysis of pre-service teachers’ attitudes to computer use: Applying and extending the technology acceptance model in an educational context. Interactive Learning Environments, 18(1), 65–79. Teo, T. (2012). Examining the intention to use technology among pre-service teachers: an integration of the technology acceptance model and theory of planned behavior. Interactive Learning Environments, 20(1), 3–18. Teo, T., Lee, C.B., Chai, C.S., & Wong, S.L. (2009). Assessing the intention to use technology among pre-service teachers in Singapore and Malaysia: A multigroup invariance analysis of the Technology Acceptance Model (TAM). Computers& Education, 53(3), 1000–1009. Teo, T., Wong, S.L., & Chai, C.S. (2008). ACross-cultural Examination of the Intention to Use Technology between Singaporean and Malaysian preservice Teachers: An Application of the Technology Acceptance Model (TAM). Educational Technology& Society, 11(4), 265–280. Wang, L., Ertmer, P.A., & Newby, T.J. (2004). Increasing preservice teachers’ self-efficacy beliefs for technology integration. Journal of Research on Technology in Education, 36(3), 231–250. Zirkel, S., Garcia, J.A., & Murphy, M.C. (2015). Experience-sampling research methods and their potential for education research. Educational Researcher, 44(1), 7–16.